Cisco’s recent focus on technology in education is evident in its release of several security-focused education tools, such as Cisco Umbrella and Cisco CloudLock. In fact, the recent acquisition of Cisco Duo only further demonstrates the upcoming Cisco playbook: security first. One of the most significant obstacles to deployment of needed technologies in schools, however, is budget. K-12 school budgets are notoriously trim – or lean. Whatever the lingo, figuring out how to secure a complex environment, educate diverse users, and do so with few resources is a big challenge. And that’s where customized Cisco Umbrella pricing comes in. Understanding this reality for schools – both K-12 and higher education – Cisco unveiled its education package. In this customized Cisco Umbrella pricing model, institutions are only charged per number of faculty and staff. There is no charge for students. We repeat: There is no charge for student-users with Cisco Umbrella. As a Cisco Gold Partner, Mindsight has had the opportunity to help schools throughout the Chicago area in implementing security focused solutions. We recently hosted Security In Schools: Securing The Education Enterprise and work directly with Cisco to provide solutions like Cisco Umbrella. This is especially critical in supporting schools where resources are already limited. In these districts, high student-teacher ratios are prevalent. Focusing on the number of faculty increases the likelihood that lower income districts can adopt improved security postures. The Cisco Umbrella pricing model means a lot of savings for districts. But Cisco Umbrella goes beyond up-front savings. The entire purpose of Cisco Umbrella is to reduce risk. Cisco Umbrella protects devices both on- and off-network, while also preventing malware, phishing, and C2 callbacks. In 2018, phishing attacks remained among the top most common threats to institutions and cost an average of $1.6 billion. Deploying proactive security measures prevents these kinds of costs on the district. Plus, the data itself is invaluable. Student data includes PII and PHI, both of which have high value on the black market. Protecting students – and their data – should be of the utmost importance to K-12 and higher education IT departments. Cisco Umbrella works by stopping malware infections in their tracks and preventing data exfiltration. It protects against intruders, working as an internet security gateway. Unlike other attack preventative tools, Cisco Umbrella stops malicious requests before they infiltrate the network. It props up your preventative barriers proactively. Remember, the customized Cisco Umbrella pricing model frees funds, so your district is better able to provide a complete security posture. That includes looking at data security layers – both internally and externally. Kids these days (we were just hoping to say that) are smart. They know what VPNs are and how to hack a network. They are tech-savvy and prepared for a very different kind of world. Threats come from both outside and inside your district network. Combined with Cisco CloudLock, which protects users internally through the cloud, Cisco Umbrella gives visibility to shadow IT and all internet activity. What’s more, taken together, CloudLock and Umbrella focus on the two-fold nature of cyber threats in the cloud – internal and external. Since over half of all data breaches are due to human error and insider threats account for over 60% of risk, this dual shield is necessary. It’s easy to deploy. Cisco Umbrella can be up and protecting your network in minutes. And because there is no charge for student-users, IT is better able to provide training and resources to the district or campus. Training is essential to security, and Cisco Umbrella – just like any security tool, works better with proper training. 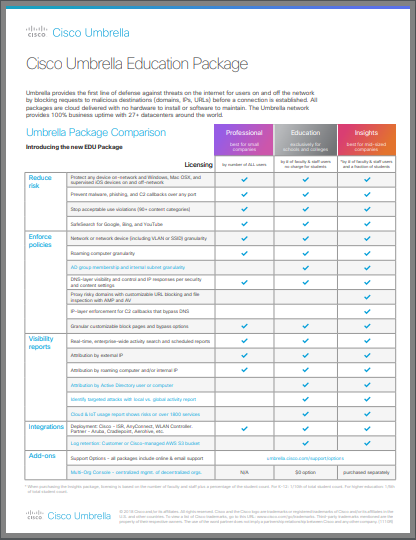 Find out more about Cisco Umbrella pricing for your district here. Get started protecting your network today. Contact us today to find out if Cisco Umbrella is right for your institution.